Theo Peeters is a Belgian neurolinguist who specialises in autism spectrum disorders. He is one of the world's leading authorities in the field and his many books, training activities and stimulating. Lars Christopher Gillberg, who has sometimes published as Gillberg and Gillberg with his wife Carina Gillberg, is a professor of child and adolescent psychiatry at Gothenburg University in Gothenburg, Sweden, and an honorary professor at the Institute of Child Health, University College London. Autism AS A Syndrome OF Hyperrealism. Steven, Sven and The Others. An Apple and an Orange. Mistanpitaaeniten. Autism AS A Developmental Disorder. The Significant Development Scales. The ven More Significant Stories. The Special Story of People With Asperger syndrome. 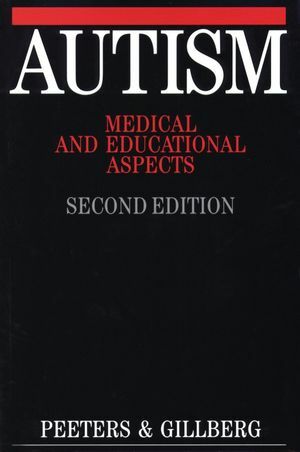 The Medical Diagnosis OF Autism AND Disorders OF The Autism Spectrum. Classic Autism, or Kanner' s Syndrome. Disorders of The autism Spectrum. Considerations for The Differential Diagnosis. How Frequently Should the Diagnosis be Made? The Biologial Basis OF Autism. Morphological and Biochemical Signs of Brain dysfunction. Laying One' s Finger on The Problem(s). A Provisional Synthesis. practical Conclusion. Education AND Guidance OF People With autism. Recommendations From The Medical Viewpoint. Above All, a Need for structure. Problems Associated With Specific syndromes of the Autism Spectrum. The Major Educational Starting Points . Behavioural problems and The Myth of Procrustes. Jan and The Limited Power of Abstraction. more on The Level of Abstraction. Maria and The Language Trap. The Five Axes of professional Training and Education. Practical Examples - Where? When? How Long? Communication. Work Skills and Work Behaviour.